Satisfy all your cleaning cloth desires as this kit contains wide assortment and variety of our high quality Photodon cloths. It can serve as multi-purpose cleaning arsenal or as sample pack. Not all microfibers are created equal, our cloths are machine washable with a streak-free cleaning design that won’t scratch paints, furniture or solid surfaces. This kit is economical and helps the environment by reducing disposable waste, this is a must have for every household. One - Large Silky Microfiber Cloth – 14 x 14”, lint free, absorbent, machine washable and won’t scratch your devices if cleaned properly. One each - premium, standard and light Silky Microfiber Cloths – lint free, absorbent, machine washable and won’t scratch your devices if cleaned properly. One - Bubble Looped Microfiber Cloth - 12 x 12" large looped microfiber cloths grab and hold dirt and dust particles instead of just pushing them around on your surface. 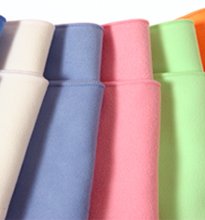 They are made of very durable, high quality Microfiber and come with a sewn edge. One - Brushed Suede -16 x 12” specially conditioned low lint, brushed knit cloth is of the highest quality microfiber cloth. It grabs onto and holds dust particles very well. This is our most versatile cloth. One - Chamois - 8x8 inch soft leather-like microfiber chamois cloths are ideal for cleaning glossy, hard, and smooth surfaces -- especially plastic. Photodon's high-quality chamois cloths will gently buff away smudges, fingerprints or streaks from most surfaces. Shipping Weight each 0.3 lb. Notes Safe for all screen and lens types. Korea/China - Traverse City, Michigan, USA. Available Sizes 6" x 7" 6" x 7" 6" x 7" 6" x 7" 8" x 8" 12" x 12" 8" x 12"